Photo by Montana Preservation Alliance. 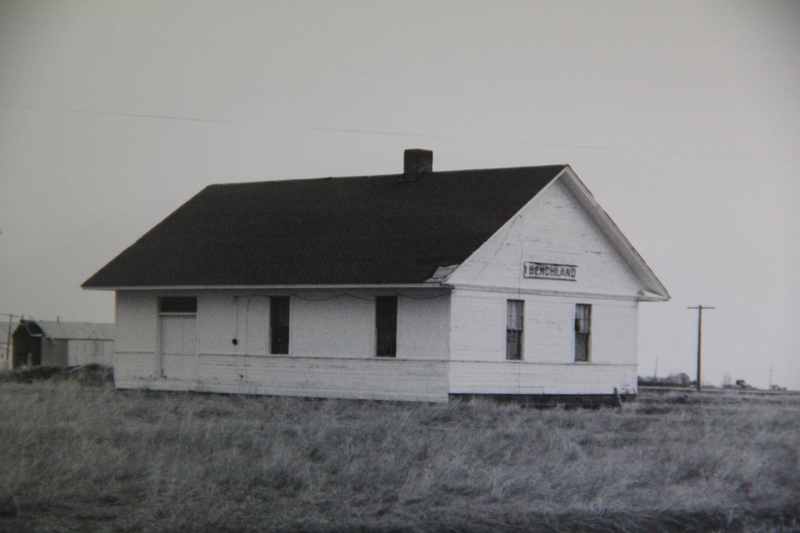 During the state historic preservation planning process in 1984-1985, the new historic preservation efforts in Lewistown, especially the focus on the sandstone masonry of the Croatians, were noted and celebrated as well as the town’s only “marked” historic site, Reed’s Fort Post Office, associated with the very early history of settlement in Fergus County and the history of the Metis who lived here in the 1870s and 1880s. Certainly much more was known about the community’s history and architecture. But there was little public interpretation, except for this log building and, on the other side, of the town, a public park with military artifacts including an ICBM missile–a rarity then and now for a public park anywhere in the west. 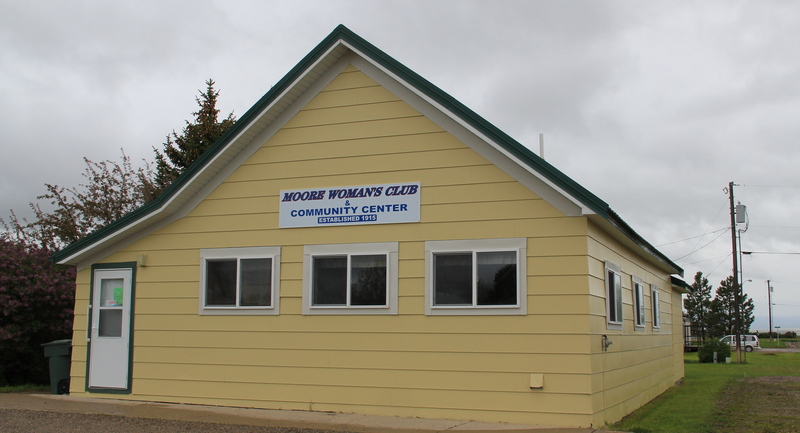 Even the local museum was at the beginning stage, sharing quarters with the chamber of commerce in a Ranch-style building, like the park, on the outskirts of town. How times changed over 30 years. 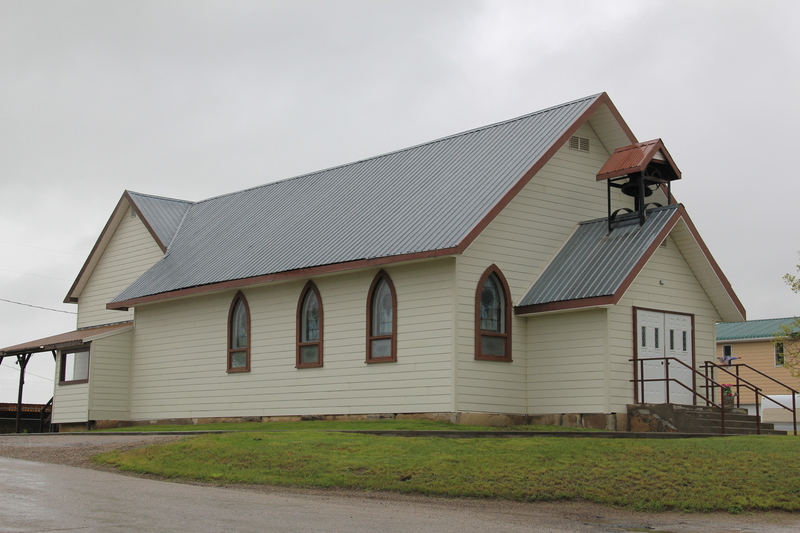 The museum is still at its location but adjacent is now a new facility, replicating a huge barn, expanded exhibits and artifacts about the region’s history. 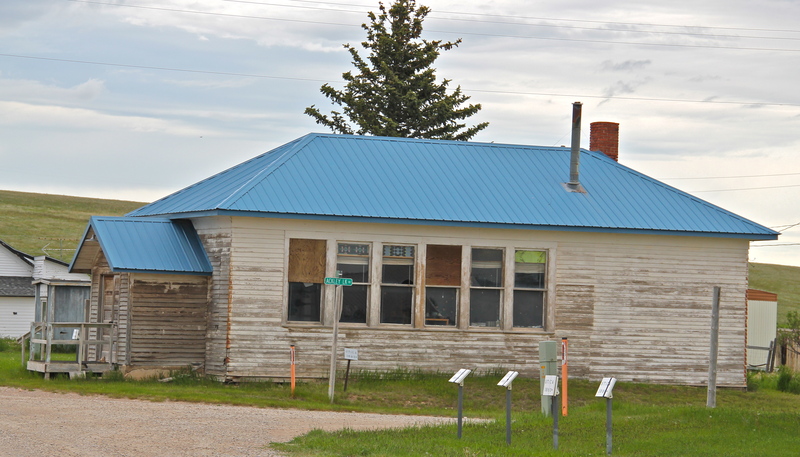 Markers about National Register-listed properties and districts exist throughout town, courtesy of the exemplary interpretive marker program of the Montana Historical Society. What happens within town is supported by recent interpretive marker installations at the highway rest stop as you enter Lewistown. From this spot there is an excellent view of the historic Lewistown airfield, listed in the National Register of Historic Places, for its significance in World War II aerial supply lines and defense. 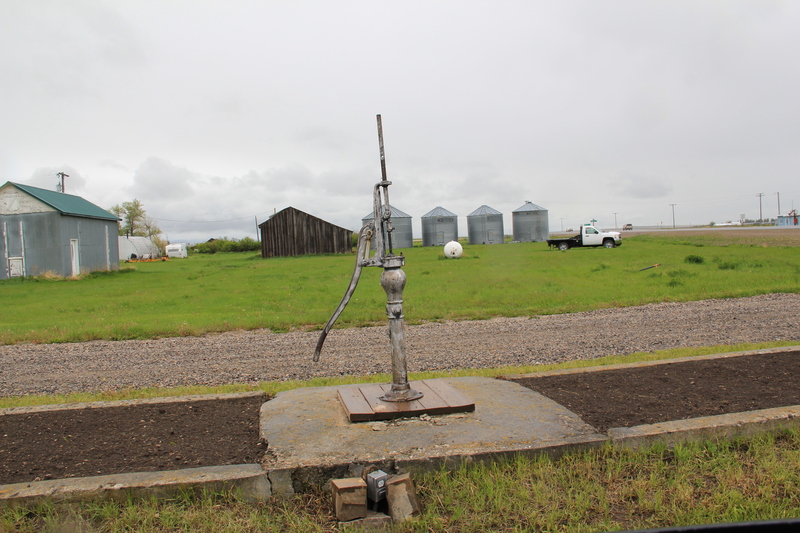 Not only can you see the historic district, you also can learn about its significance through an interpretive marker developed by Montana Department of Transportation. 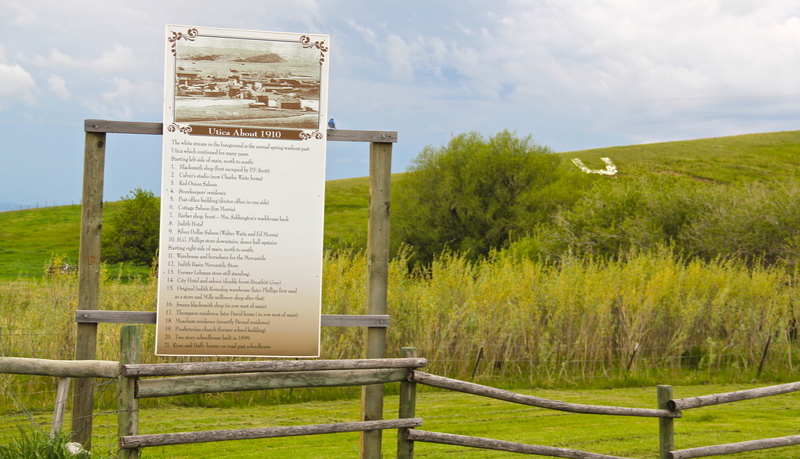 Steps away is another interpretive kiosk, related to an earlier, sadder military story, that of Chief Joseph of the Nez Perce Indians and their attempted flight to freedom in Canada in the 1870s. 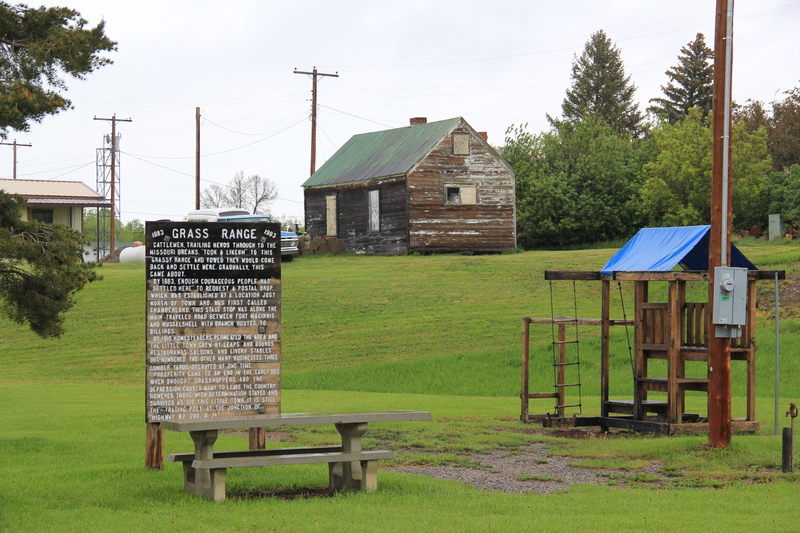 Both markers also emphasized the overall theme of transportation and how Lewistown has been crisscrossed by important historical events for centuries. 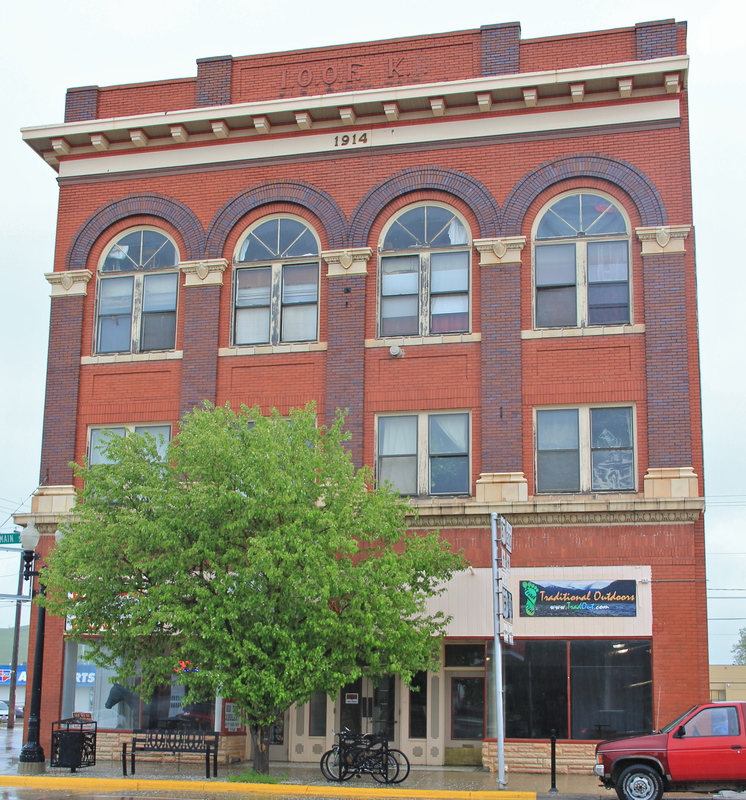 Renaissance revival style from the prominent Montana firm of Link and Haire, and the historic early 20th century domestic architecture in the downtown neighborhoods. residents alike to explore the landscape, and how history in the 19th and 20th centuries created the place where they live and play today. As we will see later in western Montana, like in Butte and Kalispell, trail systems can be the best of heritage development because they take advantage of the state’s greatest asset–its landscape and sense of the Big Sky Country–and combine it with explanations of the layers of history you encounter wherever you go, creating an asset that visitors will like but that residents will cherish, because they can use it on a daily basis. Of course recreation, to my mind, is never complete unless there are nearby watering holes where one can relax and replenish, and Lewistown is rich in those too, being they the various classic roadside establishments along the highways entering and leaving town or the can’t miss taverns downtown, such as The Mint and the Montana Tavern, where the signs speak to the good times to come. Those properties are crucial for heritage development because they are important in themselves but they also are the places that get people to stop, and hopefully explore. Using multiple pasts to create new opportunities for communities: Lewistown has it going, and it’s far different world today than in 1984. 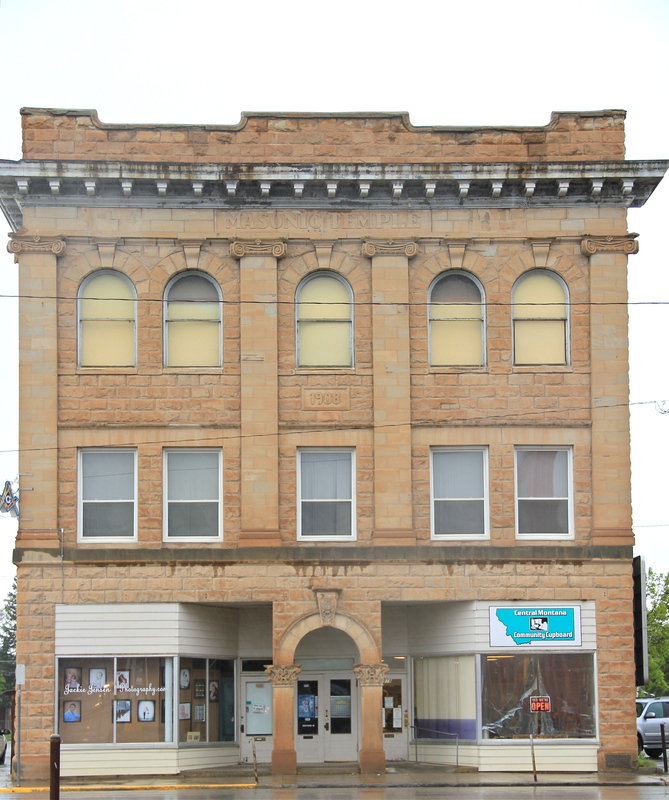 For a town of 6,000, Lewistown has an imposing, impressive public presence in its historic built environments. Clearly town founders and generations of later residents have taken the meaning of public architecture to heart–not only are they just buildings meant to hold public services but they are buildings that are meant to ennoble–to say that the town matters to those who use them, and those who come this way. contractor/designer and used the town’s Croatian stone masons to create one of the most distinctive Carnegie designs in the state. 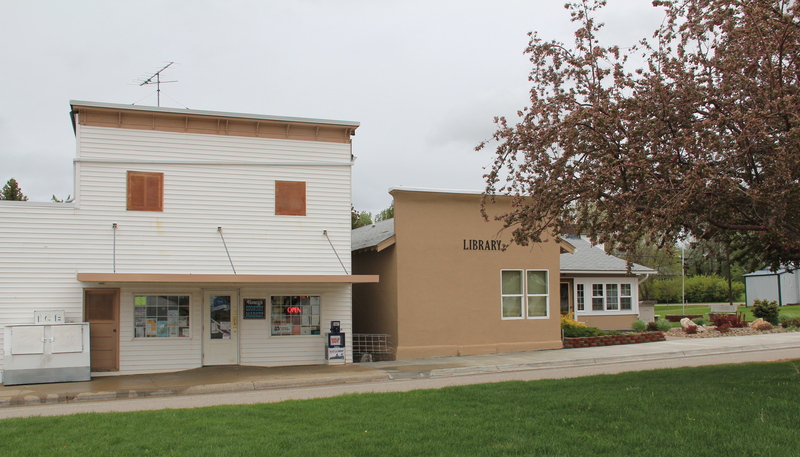 The additions below and in front came in 1990–quite the change in 30 years but also a necessary one to keep the original building as a community landmark and to serve a much different public library audience of the late 20th century. Behind the library was the place I always stayed at in Lewistown during the fieldwork of 1984–the Calvert Hotel. 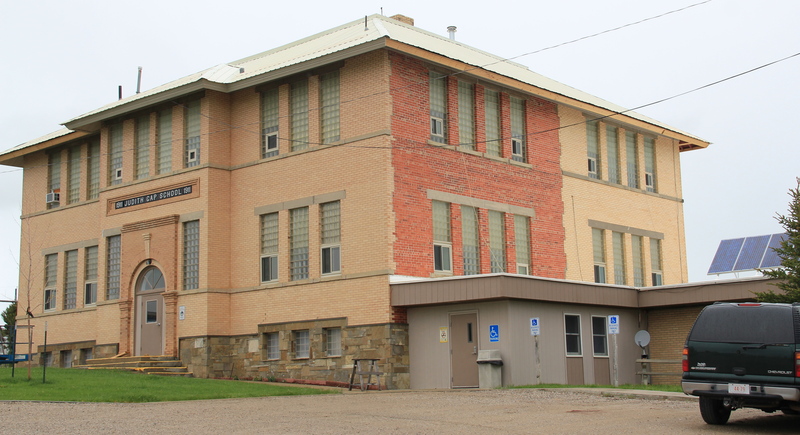 Originally built as a girls’ high school dormitory, the building was a disappearing relic from the early homesteading days before buses and automobiles dominated traffic do and from county schools. Students in faraway ranches would spend the week, maybe more, in the dorms during the school term–a reality that spoke to sense of distance and the limits of transportation 100 years ago. In the 1980s, the Calvert was much like its dorm-day appearances: some modern upgrades but it was a rustic, and inexpensive, stay, perfect for someone like me. New owners, thankfully, carried out a complete restoration and upgrade between 2007-2009. The Calvert is now a totally different place, and fits squarely in our theme of a public building serving the community well, through adaptive reuse and historic preservation, in the 21st century. The same can be said for the historic school just up the street from the Calvert and its conversion into the Esplanade condominiums. Here again, a public building still serves the community but in a different way than before. 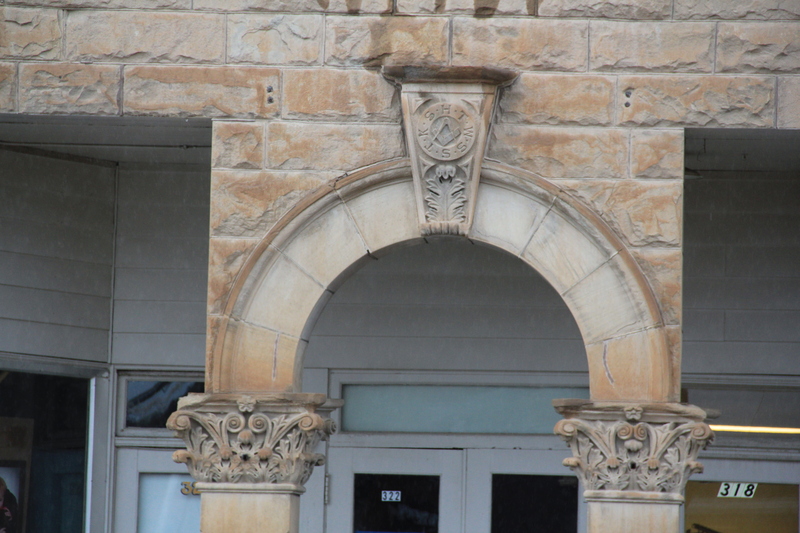 In the central business district, the grand triple-arched entrance of the Civic Auditorium is a reminder of the impact of the New Deal on the city. The Works Progress Administration did a lot of little things in Lewistown, streets, sidewalks, utilities, but its most lasting contribution is the civic auditorium of 1936, still a meeting place for community events. 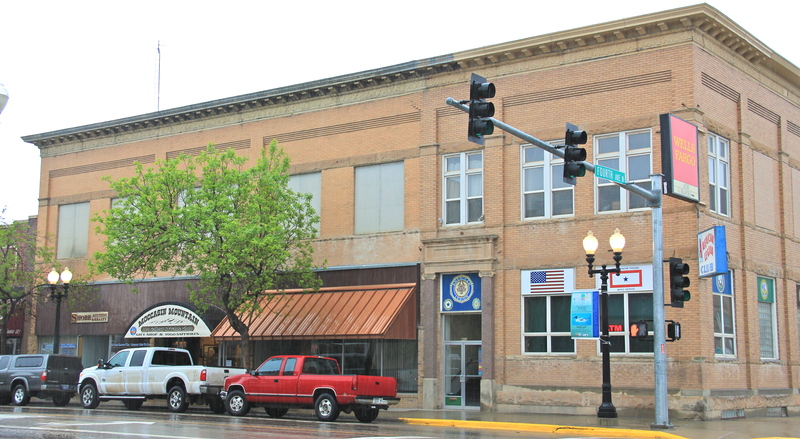 Another federally funded building a few steps away was finished during the beginning of the Great Depression, the Lewistown Post Office, an impressive Classical Revival design from 1931. 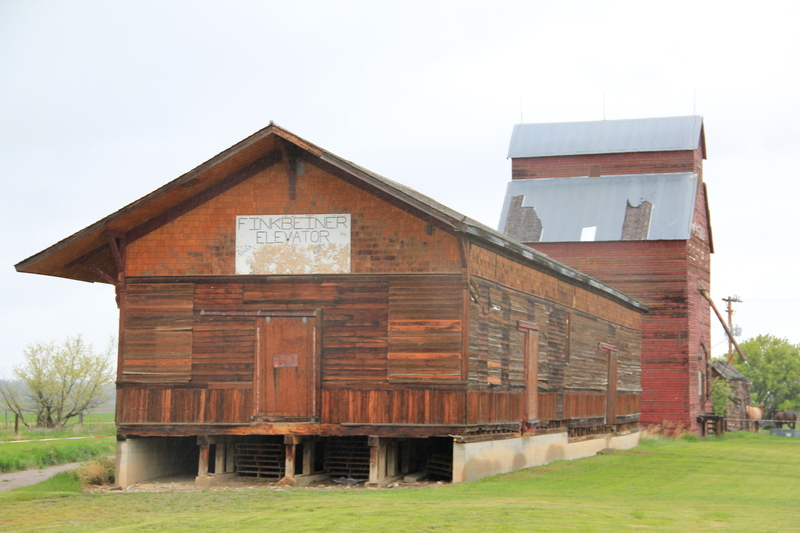 On the outskirts of town is another important set of buildings still in community service, not just to Lewistown but to towns and villages from miles away: the Central Montana Fairgrounds. The monument at the front entrance, part of the fair’s centennial celebration a few years ago, says it all: 100 years of pulling together. Yes, it is a good motto for the fair, but to my eye it’s also a fitting motto for the entire town. The fairgrounds has an array of historic barns, stalls, and exhibition buildings that define the grounds while the new grandstand defines the signature events of today’s 21st century fair experience. 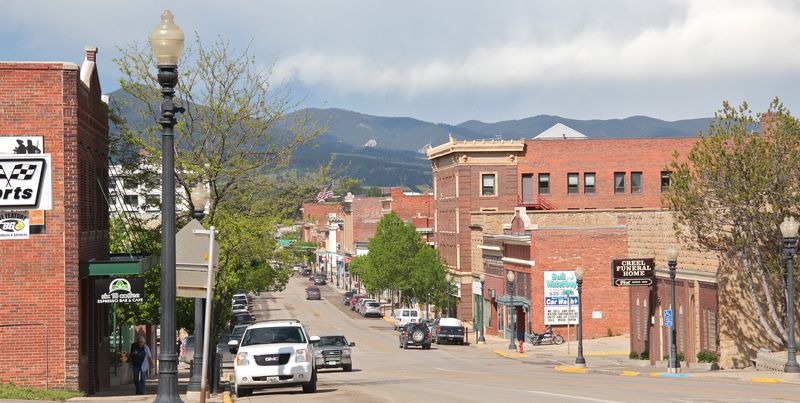 Lewistown, the seat of Fergus County, has been a hub for trade and government for eastern Montana since the 1880s. 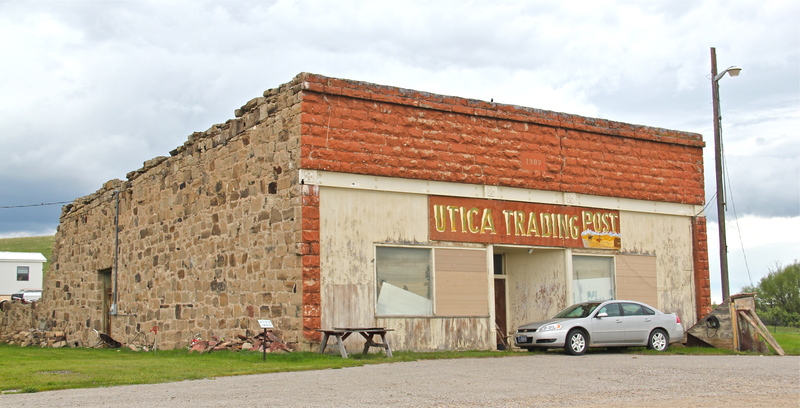 Beginning as a trading post, the town next served as a crossroads for traffic going to short-lived precious metal mines at Kendall, Maiden, Giltedge, and other places. 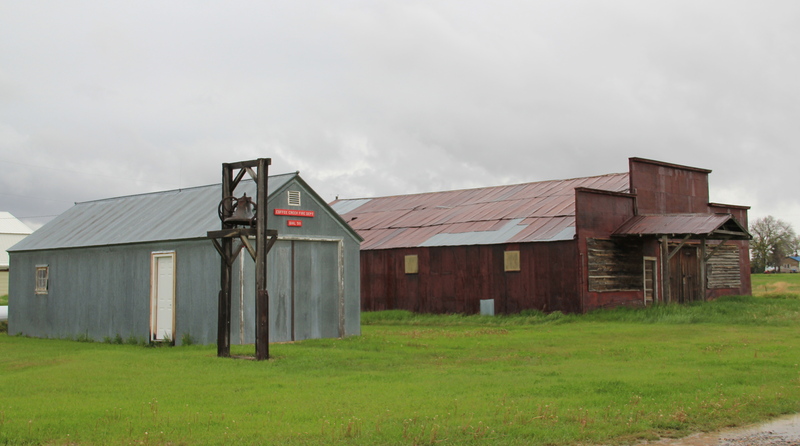 Cattle ranches, such as the famous DHS Ranch and the N-Bar Ranch, also surrounded the place. By the turn of the 20th century, the town had over 1,000 residents. 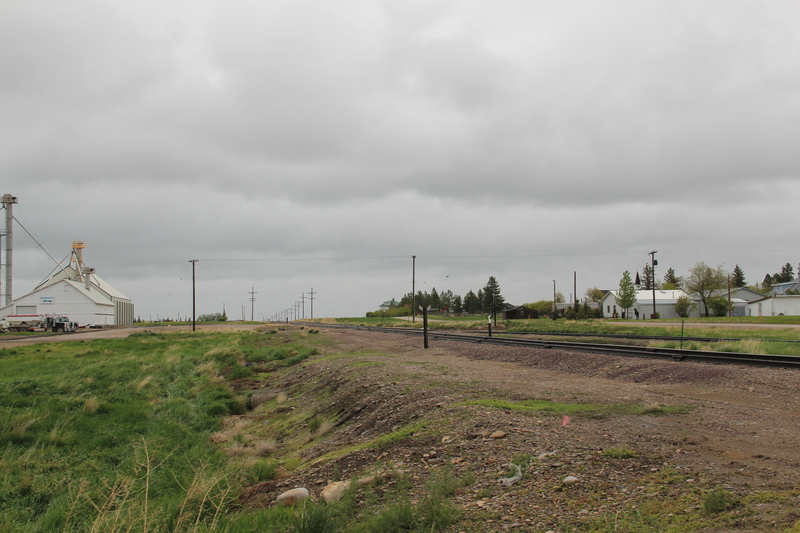 But by this time, railroad companies eyed the area for possible agricultural development, and within 20 years Lewistown had boomed–gaining six times its population–and a fascinating array of commercial and public buildings in the wake of the population growth. complex as a statement to its wishful dominance of the agricultural trade. Shortly after the closure and bankruptcy of the line in the late 1970s and early 1980s, the depot became a large adaptive reuse project, turning the Milwaukee Road complex into the Yogo Inn and convention center, where, in 1984, I attended the Montana Historical Society statewide history conference. 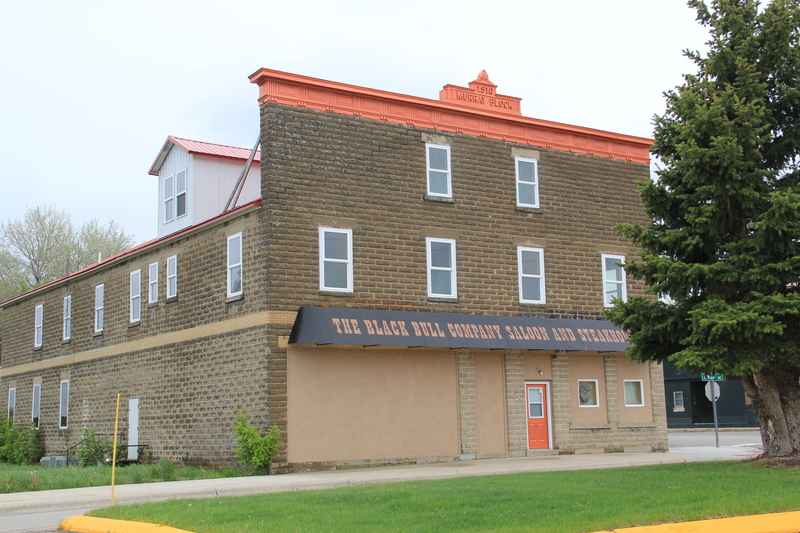 The bloom grew stale over the decades and when I visited in 2013, the Yogo was clearly on life support; I was encouraged in May 2015 to find renovations underway–maybe there will be a third life for this Milwaukee Road landmark in Lewistown. The Great Northern and the Milwaukee created the transportation network that brought homesteaders to central Montana by the thousands. 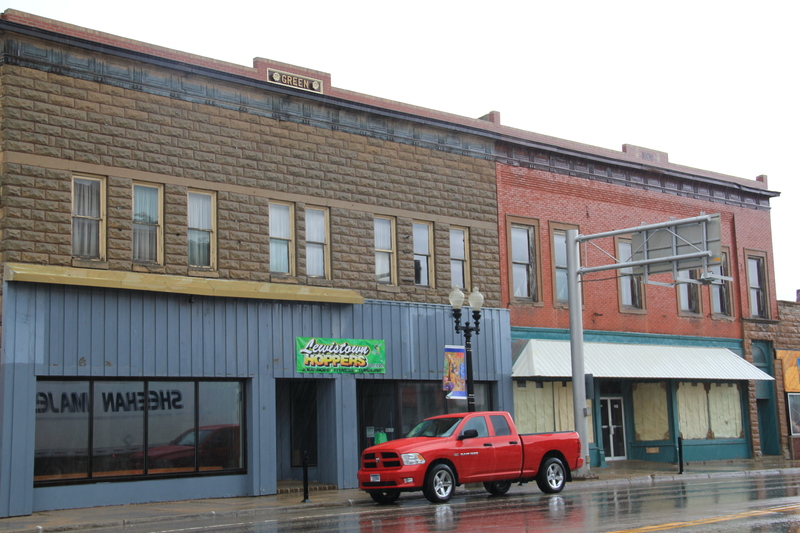 Merchants, bankers, and craftsmen then rebuilt the downtown from 1904 to 1916, and much of that flurry of construction still serves residents today in the central business historic district, which is listed in the National Register of Historic Places. Classical Revival was the architectural statement of choice to this new Lewistown taking shape along Main Street. The architects of the Montana State Capitol, Bell and Kent, designed a new Bank of Fergus County (above, on the right) in 1904. 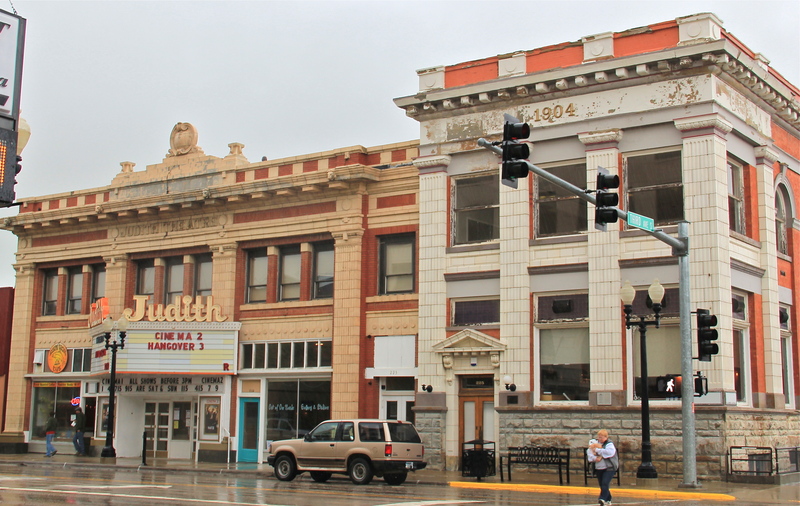 It received another layer of classicism in the pilasters a decade later when owners wanted to match the flashy Judith Theater (1914), certainly one of the great examples of Beaux Arts design in a small Montana town movie palace. 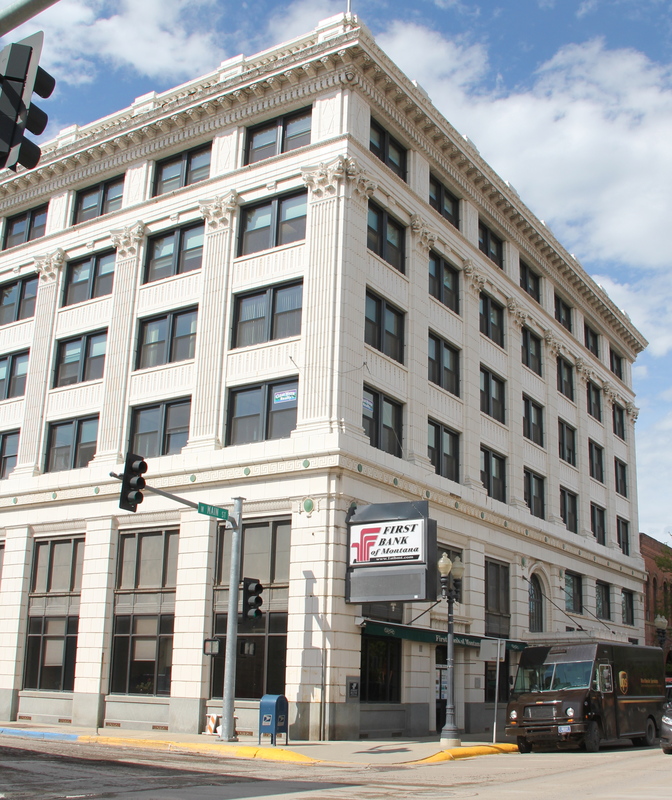 By 1916, however, bank officials were ready to support the town’s most complete interpretation of Classical Revival design in the new Montana Building, designed by the firm of Link and Haire. The bank seemingly had few limits in front of it–homesteaders still arriving and agricultural prices were high. 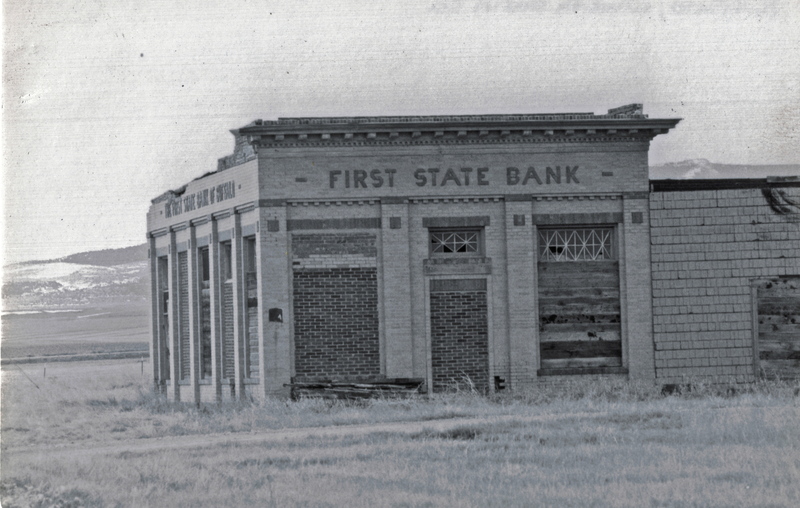 But the boom went bust in the early 1920s and by 1924 the building had new owners, the First National Bank. It has remained home to financial institutions ever since. The splashy Beaux Arts classicism of the banks and theater catch your eye but much more common are two-story commercial blocks, often with a more understated classicism, where retail businesses used the first floor and professionals occupied the second. 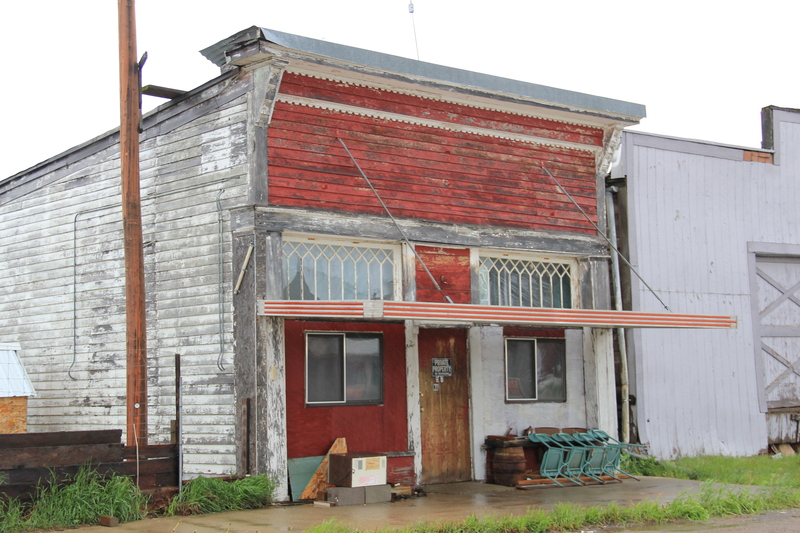 The town had a several gifted craftsmen who left their mark in these buildings and others. 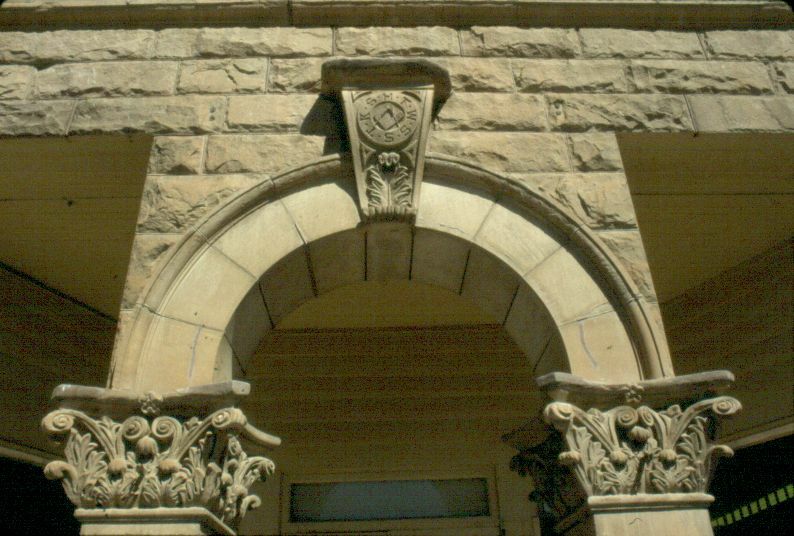 Croatian stonemasons left impressive stone Romanesque arches at the Masonic Lodge, a detail I photographed in 1984 (left) and 2013 (right). The building itself is a dignified statement of both craftsmanship and purpose, combining both classical and Romanesque elements using locally available stone. It’s one of my favorite buildings in town. Not far away is the I.O.O.F. Hall, from 1914. Here is an even later example of Romanesque arches highlighting a building that is both a fraternal lodge but also valuable retail space. Be they multi-story or just one-story commercial businesses, this set of commercial designs convey so strongly the promise of early 1900s to thousands of Montanans. Lewistown’s population had reached 6,000 by 1920–that generation would be shocked to know that remains the population today. Much more on Lewistown to come. Milwaukee Road Corridor, Moore, 1984. 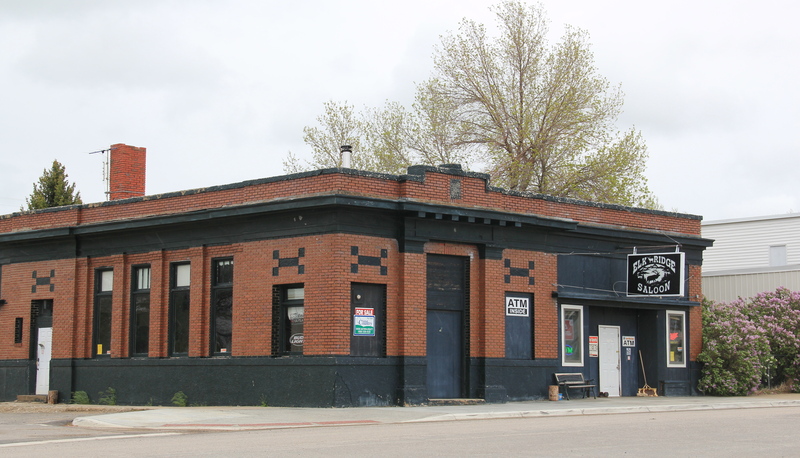 In my work with the State Historic Preservation Office in 1984-1985, my colleagues put up with many of my own peculiar interests and views of the Montana historic landscape, especially the focus on public buildings and the state’s railroad corridors. 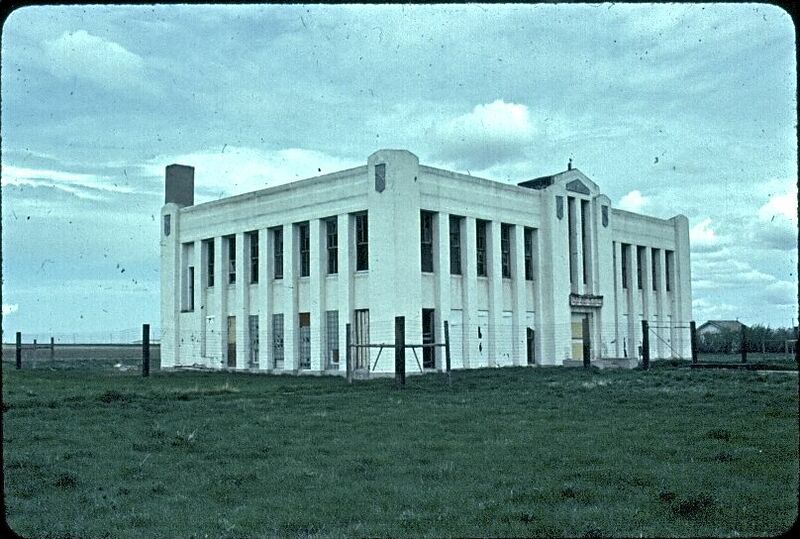 My interests, however, in the country towns of the Judith Basin was probably always a puzzler; staff always wished I would press on to Lewistown, where some of the best preservation work in the state was taking place in the mid-1980s (much more on Lewistown a bit later). 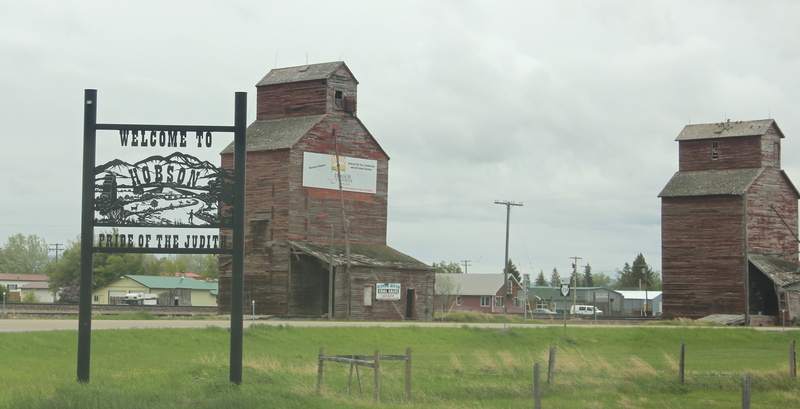 But I must admit that the maze of small towns–never numbering more than 200 or so souls in any given place–created by the railroads as they fought for market dominance in the rich agricultural region of the Judith Basin some 100 years ago was just fascinating. And they remain so today. 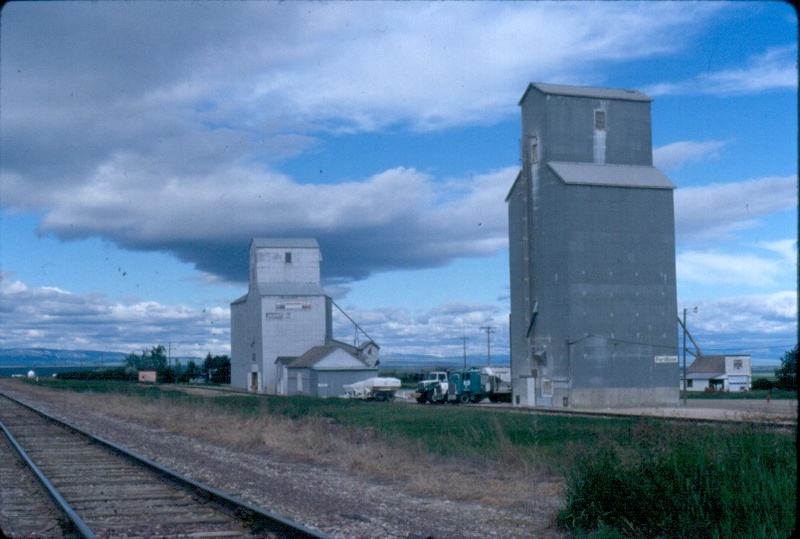 The geographer John Hudson had provided basic insights on the creation, distribution, and purpose of the country towns in the larger development of the northern plains–he coined the phrase “plains country towns.” The constant elements that they all shared–oriented to the tracks, the dominance of grain elevators, the prominence of depots–underscore the railroad era origins. But the towns all had their own individual places and statements, be it a woman’s club, a library, the school, and the bars and taverns. Thirty years later, much was missing from what I experienced in 1984–every place lost population between 1980-2010–but much still remained, and residents seemed determined to keep it that way. Moore still has its grain elevators but the Milwaukee depot is long gone, creating an empty space along the corridor. Moore has the look of so many Milwaukee Road towns with a T-plan design apparent today even as the town decline from its height of 575 residents in 1920 to the 193 of today. is undoubtedly the major reason that the town is still here today. The Great Northern Railway spur line that snaked north from the Yellowstone Valley at Laurel through the Judith Gap then the basin was always a corridor of great interest to me, although the towns created along the way were small, seemingly inconsequential compared to the linking of Great Falls and Billings. 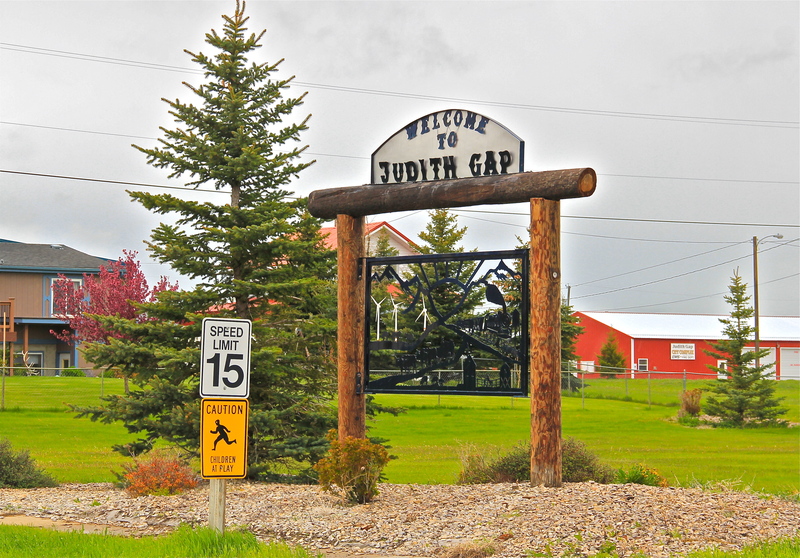 Traveling north out of the Yellowstone then Musselshell valleys, the Great Northern line entered the basin at Judith Gap, and the homesteaders who followed built a grand two-story brick school that spoke of their ambitions. The corridor then left in its wake places forgotten today. 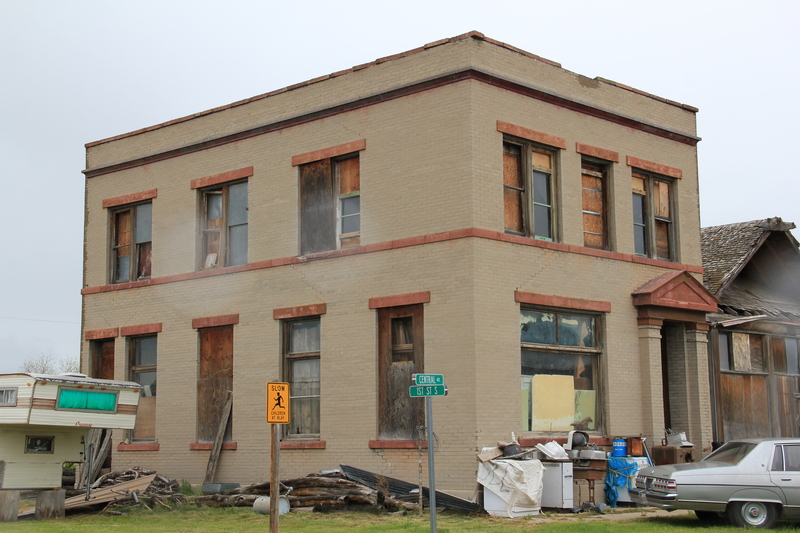 Travelers along U.S. 191 may notice the old brick state bank building and elevators at Garneill, but they may not. 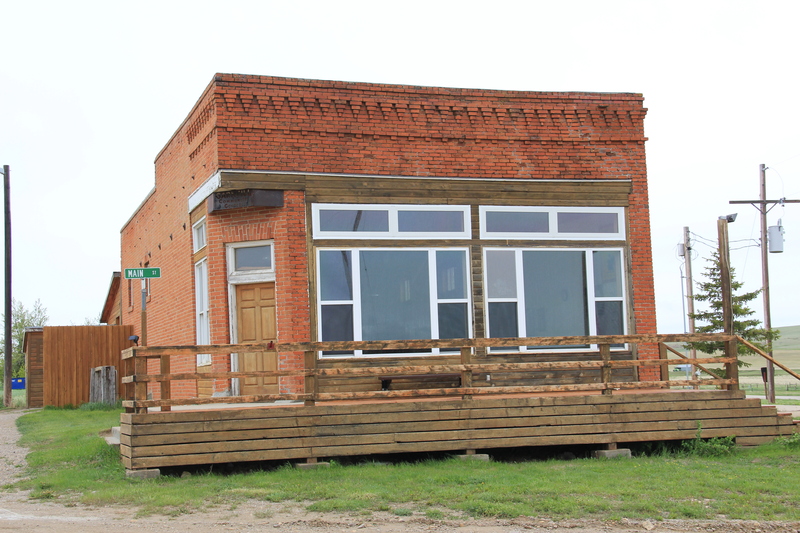 The highway veers away from the railroad line at Garneill, meaning that the old state bank at Buffalo was a forgotten place in 1984–and the town remains so today. First State Bank, Buffalo, 1984.
point of focus, although most traffic, commercial and otherwise, relies on the highway. Hobson’s population when I visited in 1984 was at its height, 261 people in 1980, and it still tops over 200 today. 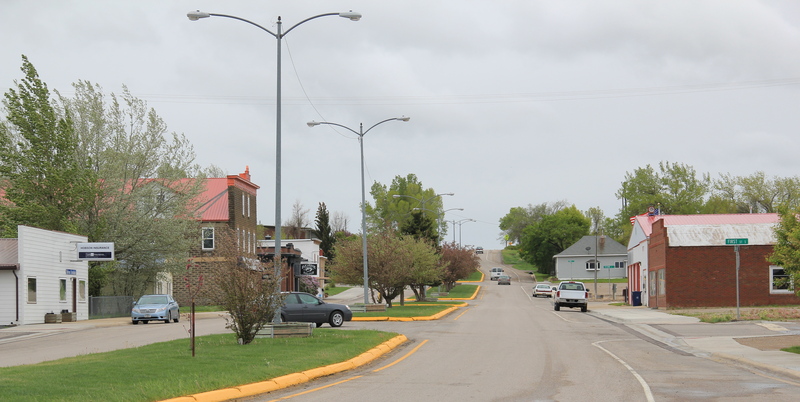 Another defining characteristic is Hobson’s rather unique (for a plains country town) boulevard plan. 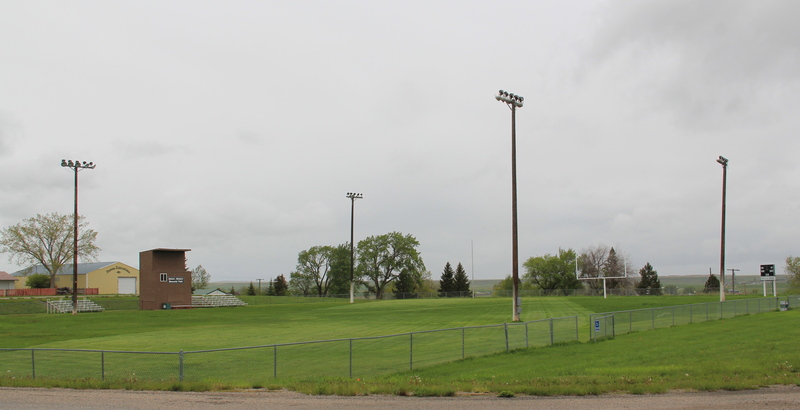 On either side lie business and public buildings and the street ends at the high school, where the six-man football field is a central element of the community’s public landscape. 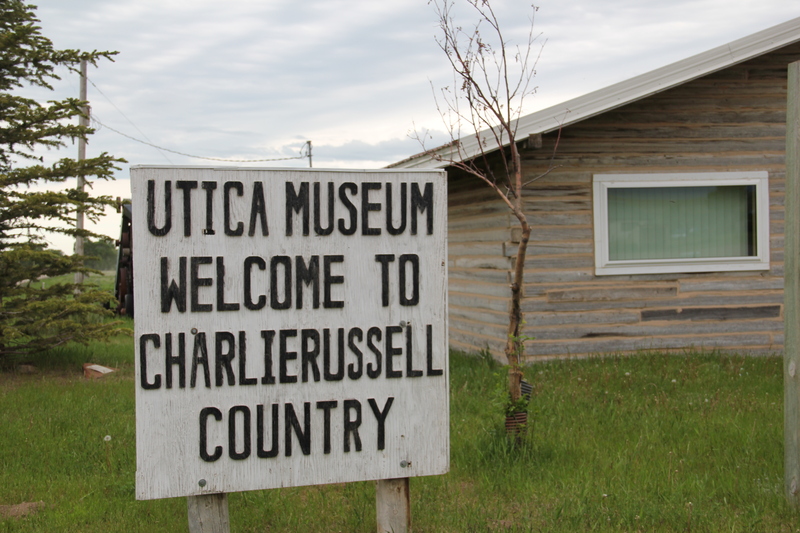 basin, the cowboy town of Utica, made famous by the paintings and writings of Charles M. Russell, the state’s most famous artist. Utica has a strong sense of itself, although it is justa tiny place today. A large part of that sense of the past is maintained and enhanced by the work of the Utica museum, the local historical society, and the town rod and gun club. Utica has a level of public interpretation that was certainly not in place in 1984 and that today is rarely matched in a small Montana town. worse for the wear of 100 years of use, but it is still here, and the stone construction speaks strongly to the vernacular quality of the area’s built environment. 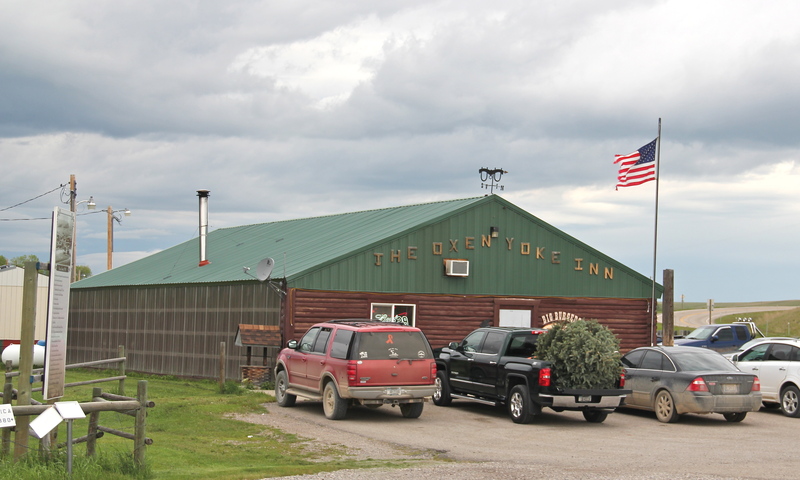 times at the Oxen Yoke Inn–why else would you locate the town’s primary interpretive sign next to the bar’s parking lot. For most travelers the highway from Hobson at the eastern end of Judith Basin County to Stanford, the county seat, in the center of the county, is just open road. But between those two towns three Great Northern hamlets still have significant remnants of their past. 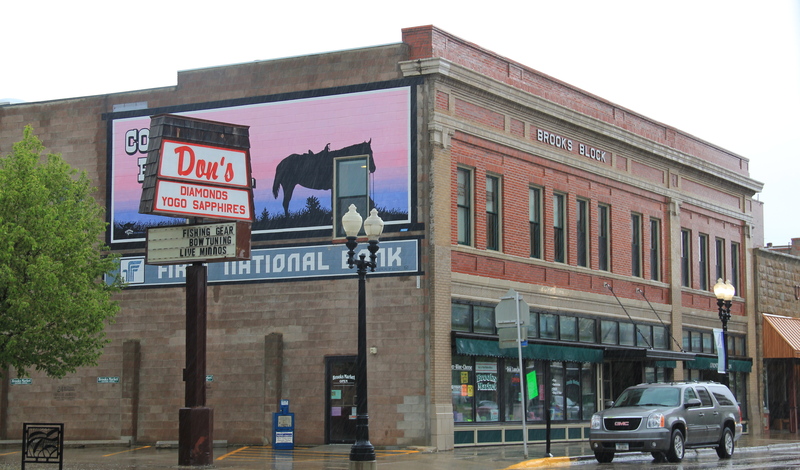 Moccasin was such a favorite in 1984 that the resulting book from the survey work, A Traveler’s Companion to Montana History, had two images from the place–the New Deal school, with its totally out of place but flashy Art Deco design, and the two-story Classical Revival styled bank building. Those landmarks remain in Moccasin, but much worse for the wear. The school is clearly among those threatened landmarks highlighted by the National Trust for Historic Preservation in 2012. The bank is hanging on, barely. 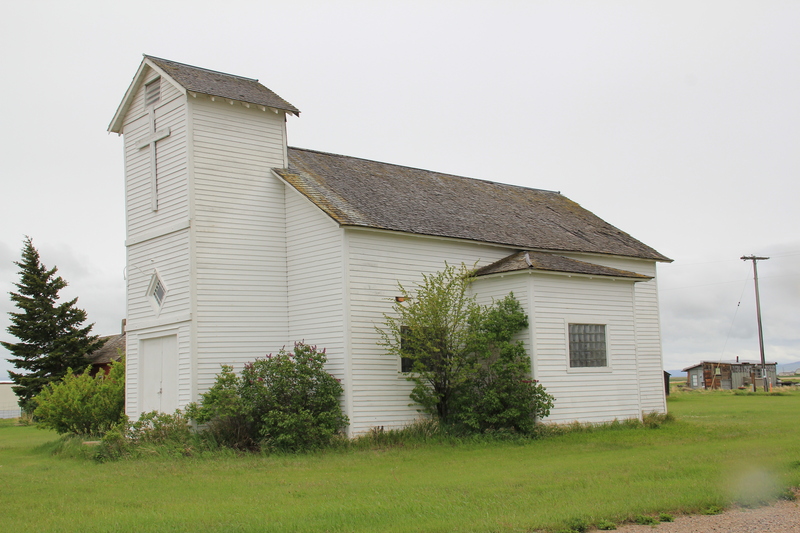 Moccasin still has other historic buildings worthy of note, such as a church, its town pump, even a telephone booth (a real disappearing part of the landscape from 1984 to 2014). More importantly, its historic Great Northern combination depot, although battered, still is along the tracks nearby the elevators, reminding anyone looking closely enough of the railroad roots of the place. The next two towns of Benchland and Windham also retain their historic depots. The Benchland station has deteriorated in the last generation as documented in a comparison of a 1984 image with one from 2014. 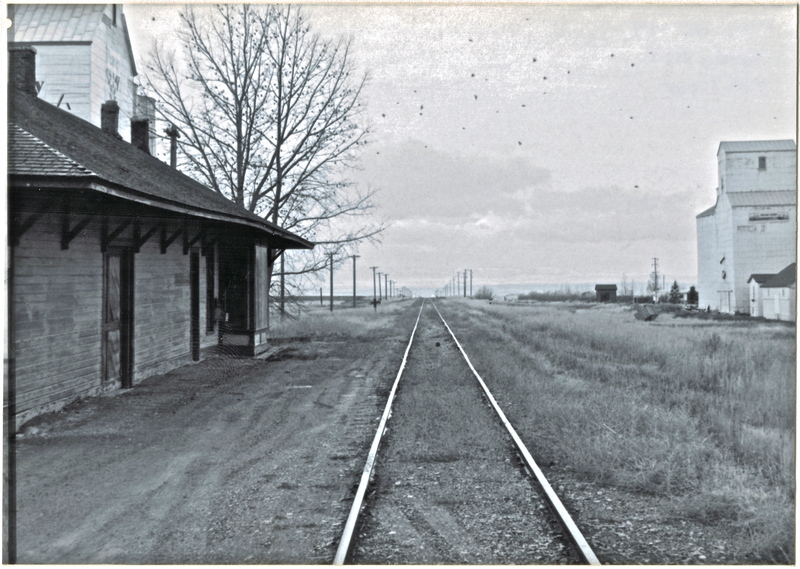 The Windham depot has been moved slightly off the tracks–but still within a stone’s throw of the rails. The station, along with the historic commercial strip of the T-town plan, and historic elevators, still give meaning to the “W” of the town sign. 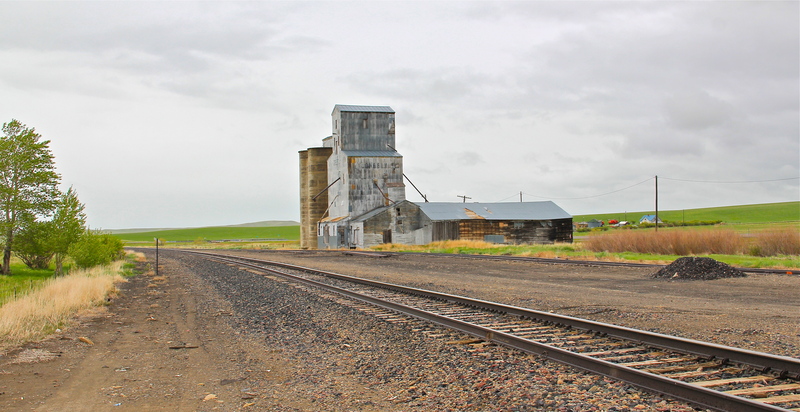 The curve of the tracks headed to Stanford is a good place to rest with this post–more on the plains country towns of the Judith Basin in the next post. 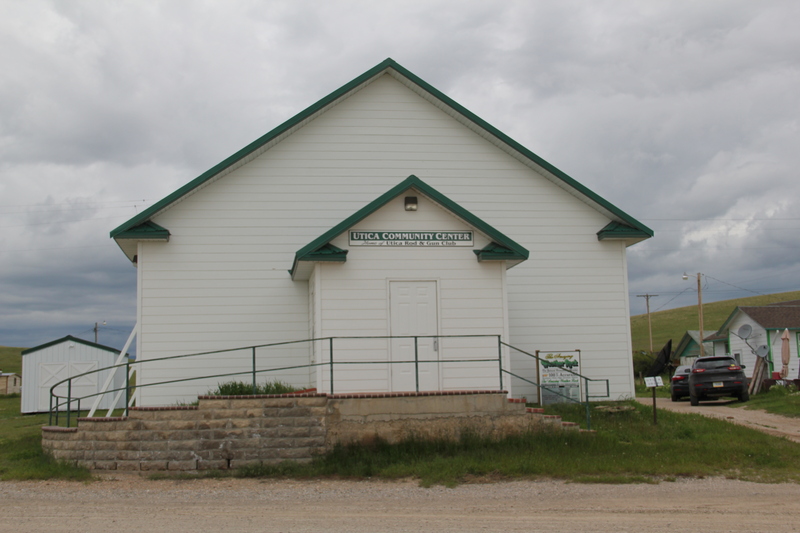 Grassrange is a central Montana crossroads, where U.S. Highway 87 meets Montana highways 19 and 200, and it serves as the eastern gateway to Fergus County. The wonderful vernacular roadside statement of “Little Montana”–an obvious homage to the much larger and more famous “Little America” in southeast Wyoming–reminds even the most oblivious traveler that you have reached a highway crossroads. As the name implies, this is ranching country, with several of the state’s most famous spreads nearby. 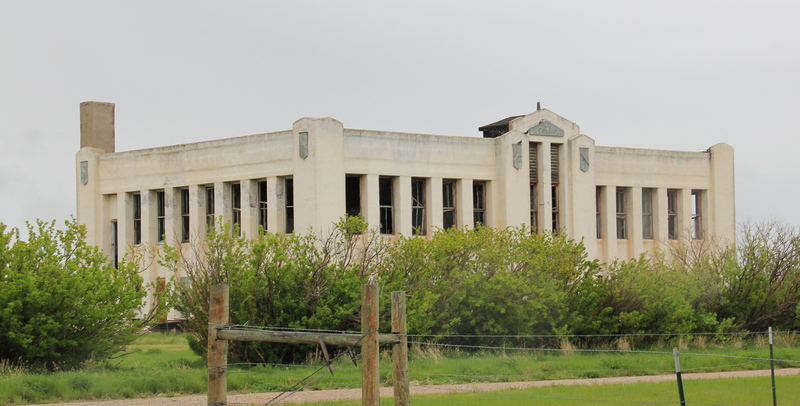 The school reflects the pride in ranching, witness its school emblem and name the Rangers. 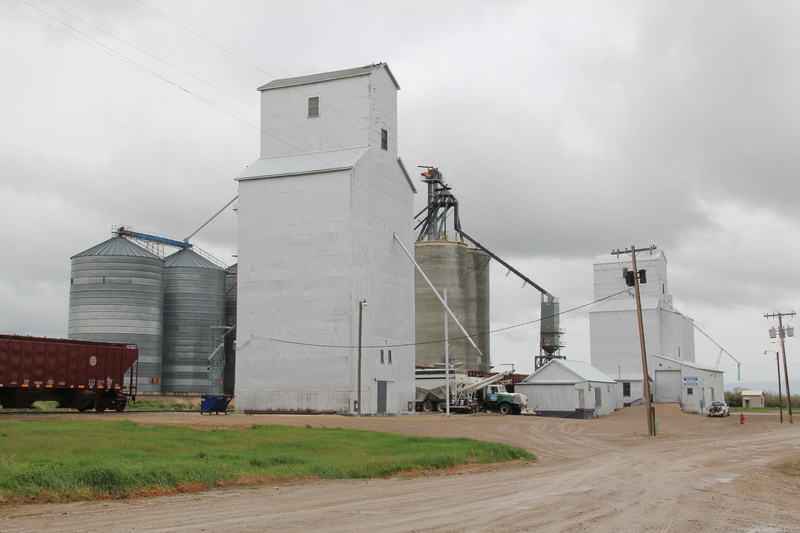 There is more than livestock to the history of Grassrange, as the elevators attest. This is also farmers’ country since the early 20th century homesteading boom. 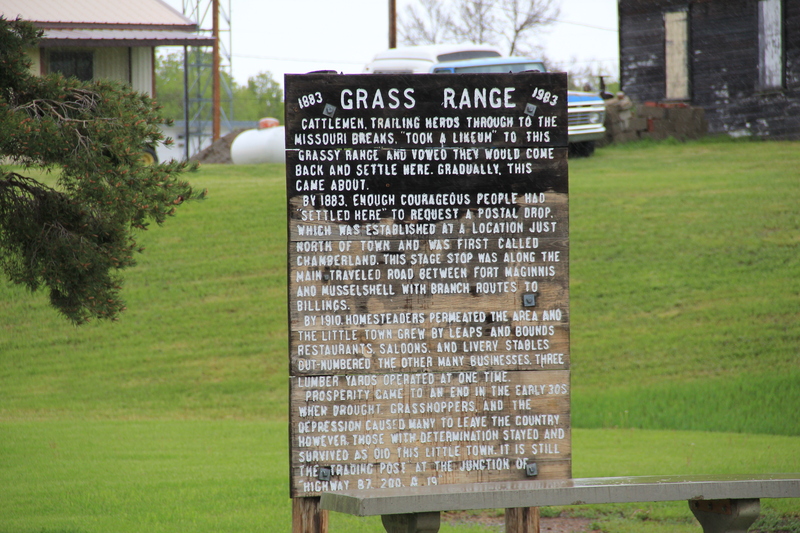 Yet Grassrange has never been a bit town itself. 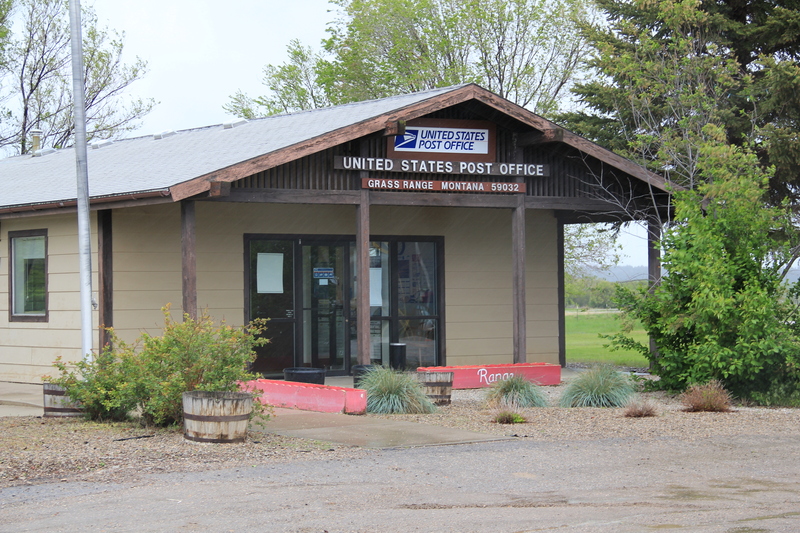 It dates to 1883 when the first post office was stab listed to serve surrounding ranchers; the town still has its standardized 1970s post office building. 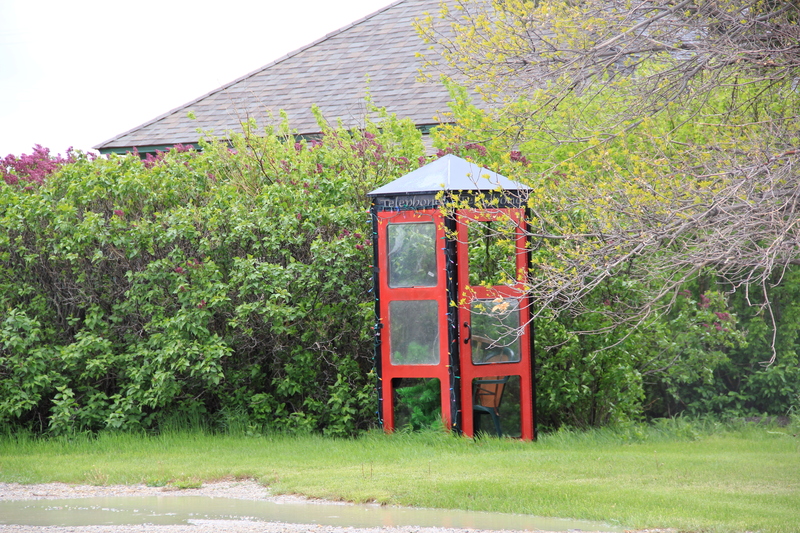 Grassrange has a definite sense of its past. Despite its scant population–just over 100 in the 2010 census–it has a city park (top image of this blog) plus its own public interpretation of its history, literally carved from local hands. 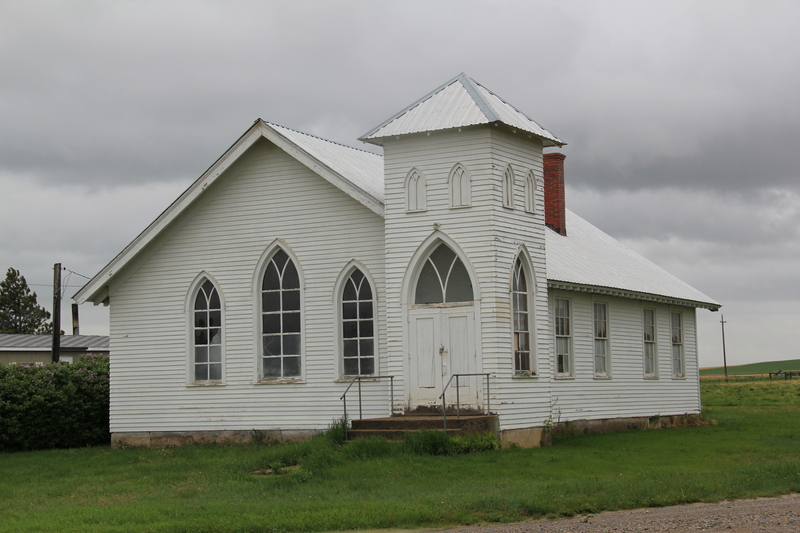 It also has surviving historic landmarks, from a false-front Masonic Lodge to a vernacular Gothic-styled United Methodist Church, to a well-worn one-block commercial building that, considering its add-ons and alterations, has served the community in several different ways over the last 100 years. 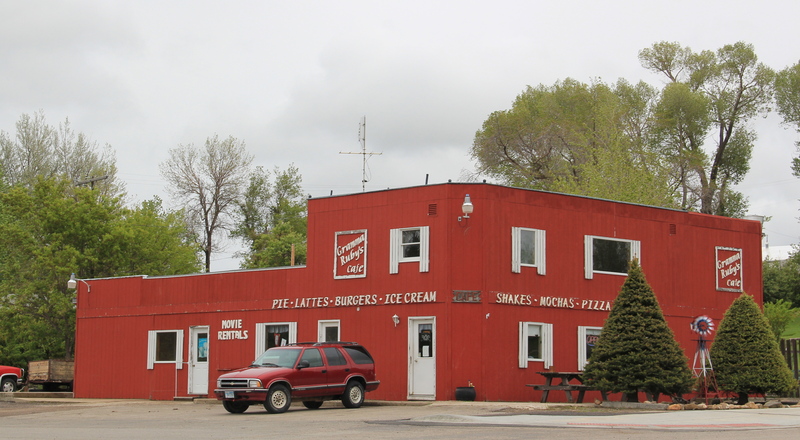 Many rural Montana crossroads are little more than a combination bar/cafe/store/gas station today. 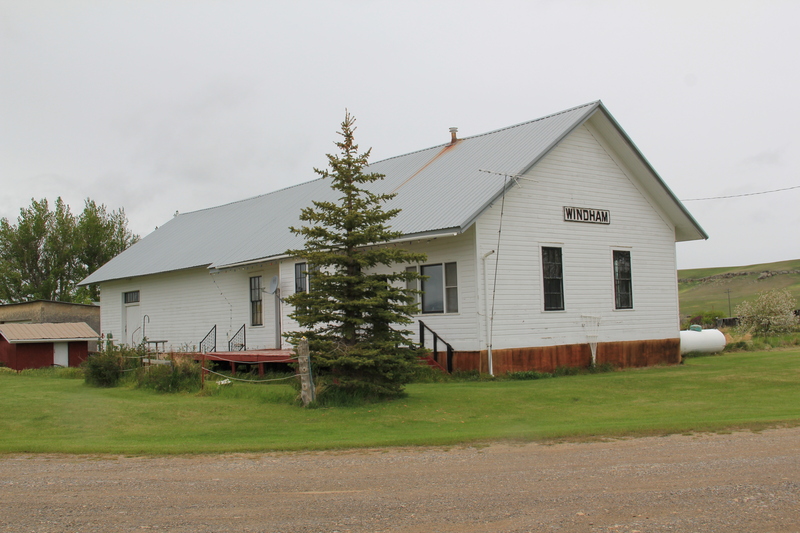 Grassrange has dwindled in size since my first visit in 1984 but it has kept its school and such community buildings as the church, Masonic hall, and city park. 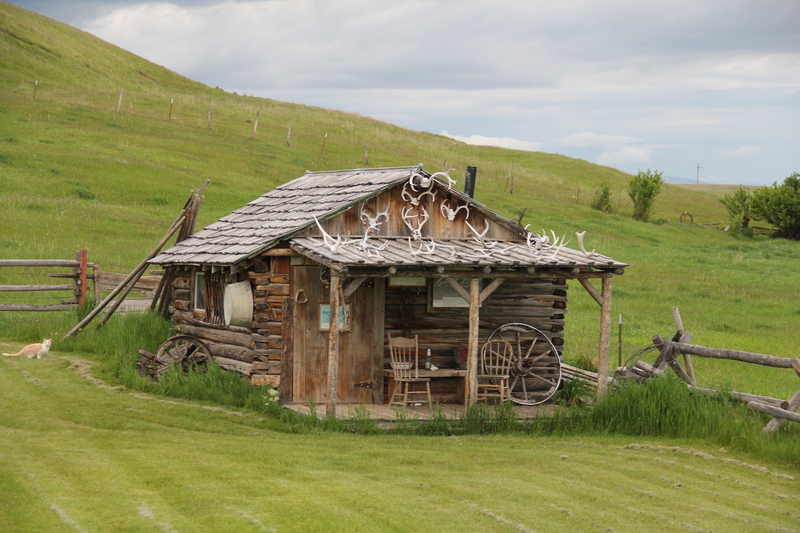 It is home than the home of “Little Montana”; it’s a reminder of the precarious state of Montana’s small towns across the vastness of the northern plains. 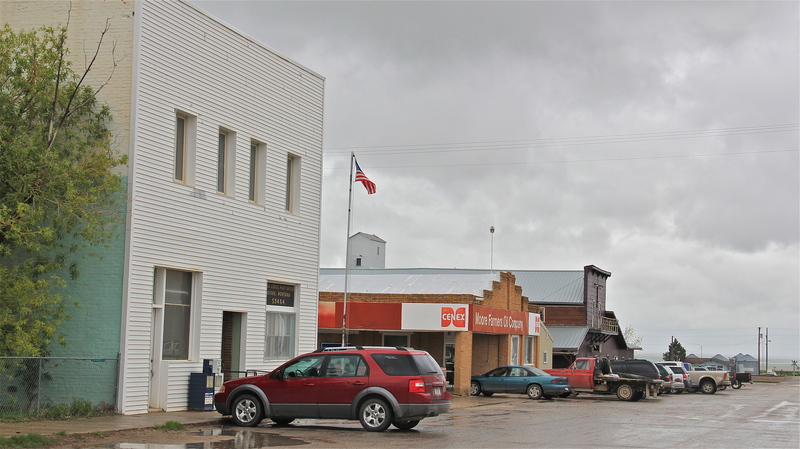 Coffee Creek, Montana, located on the high plains of northeastern Fergus County, is undoubtedly best known today as the backdrop for a series of Harlequin romance novels. The setting and the starkness of the landscape is probably not what you envision in a romance novel but it does convey the reality of what Coffee Creek was, and is, today. 20th century vernacular Gothic design, but it no longer holds regularly scheduled services. 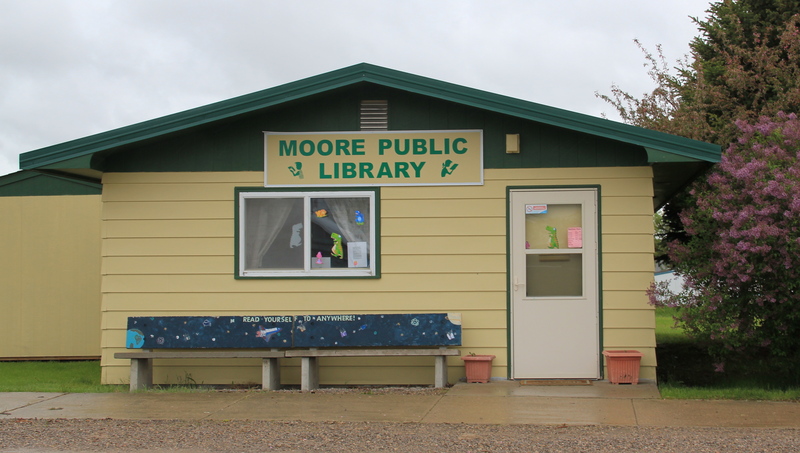 It remains a community landmark. 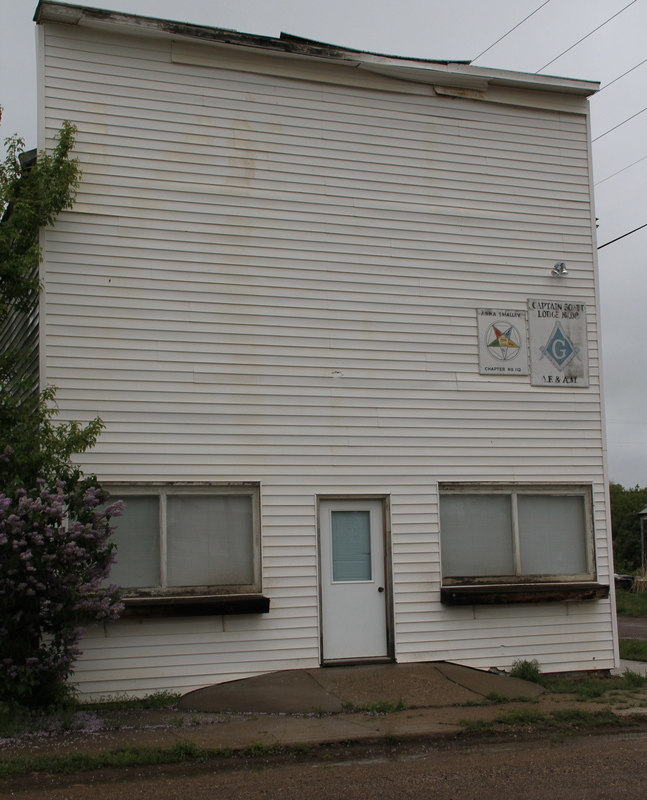 Another community landmark is the building above, which I believe is a Community Hall from the 1920s or 1930s. 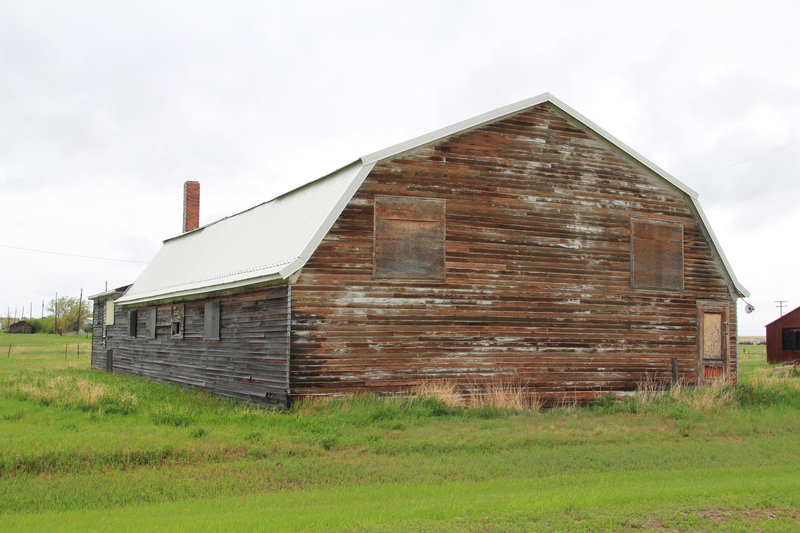 Throughout rural Montana in the 1920s a movement began to build structures where the homesteaders who stayed could gather and have events, play basketball, or dance the night away. 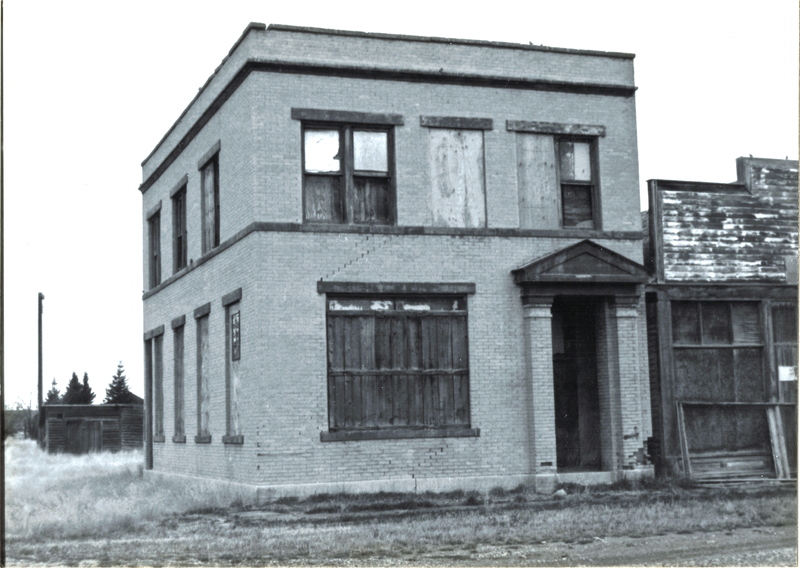 New Deal agencies in the 1930s built many more, like the one this blog has already recorded in Sanders, Montana. 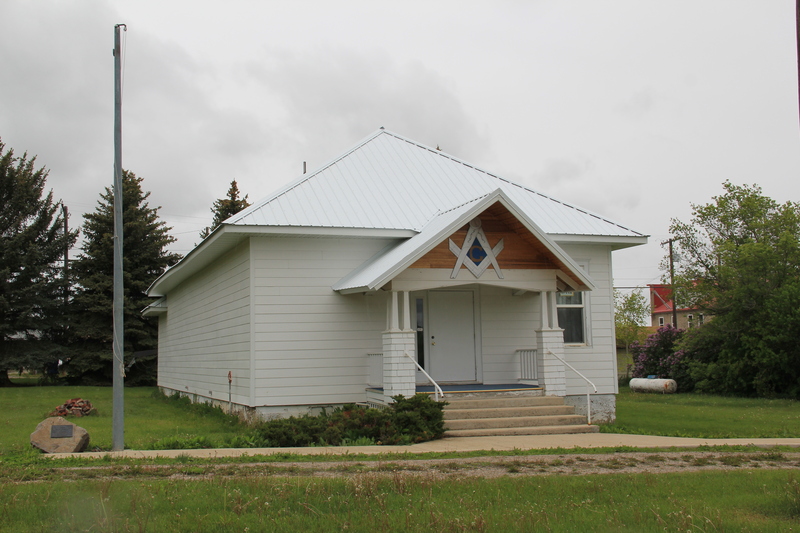 This building in Coffee Creek reminds me of the Sanders community hall–hopefully someone reading this blog can add details about it. 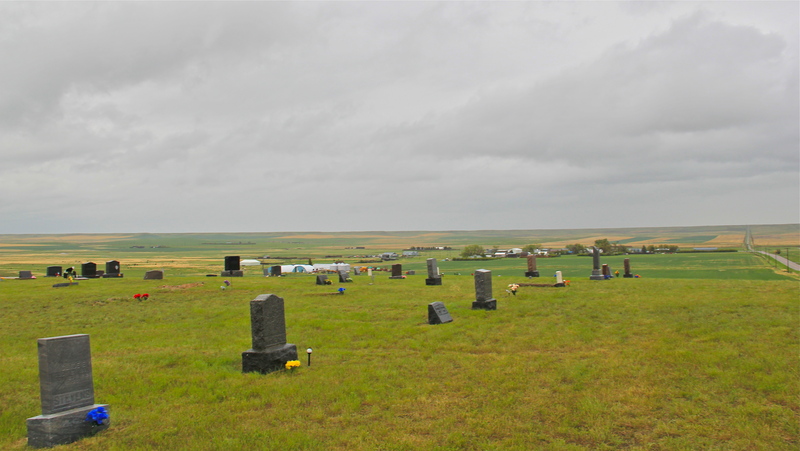 The volunteer fire hall, like the post office, is one community institution still in service to local residents and surrounding ranches as is the town cemetery, perched to the north, high on a hill overlooking the town, Highway 81, and ranches as far as you can see. 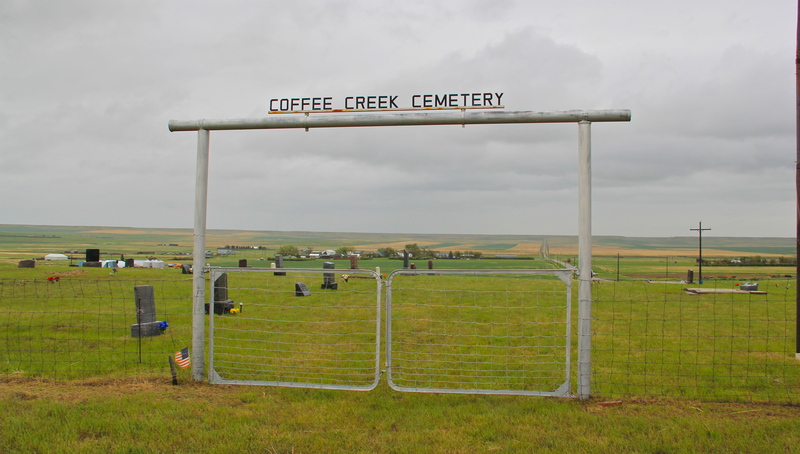 As the buildings of Coffee Creek fade away, here the cemetery will record the names of those who staked out this place as their home, while those who return to pay their respects will keep the memories of this disappearing place alive for as long as they remember to return.